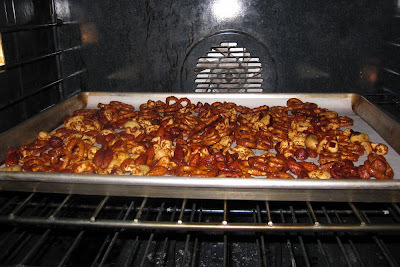 Does spiced nut snack mix count as baking? Sure, why not! It goes in the oven! And this recipe is by an extraordinary baker, David Lebovitz. And I like it! Those are some pretty good reasons. 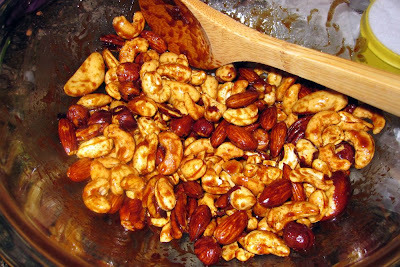 Preparing flavored, spiced nuts is simple, and they make a great hospitality gift when you're invited to a dinner party, or to serve at your own dinner party. People like to nosh while they schmooze, so let's give them something to nosh on! 1. Preheat the oven to 350 degrees. 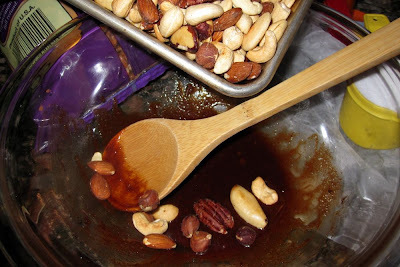 Spread the nuts on a baking sheet and toast for 10 minutes. 2. 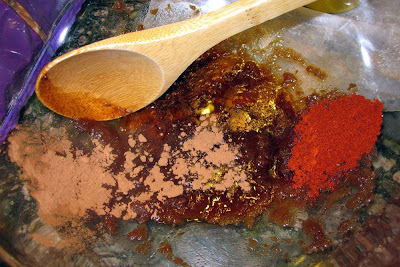 Meanwhile, in a large bowl, mix the butter, brown sugar, cinnamon, chili powder, maple syrup, and cocoa. 3. 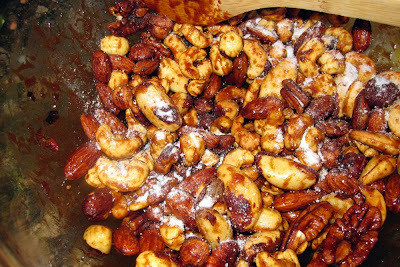 Stir the warm nuts into the spice mixture to coat them completely, then sprinkle on the salt. 4. 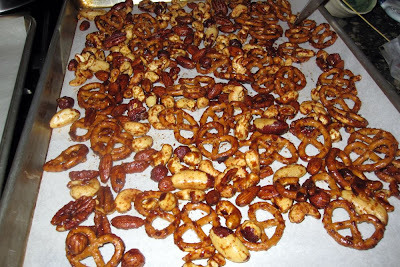 Mix in the pretzels, then spread the mixture on the baking sheet and bake for about 15 minutes, stirring once or twice, until the nuts are well-glazed and browned. 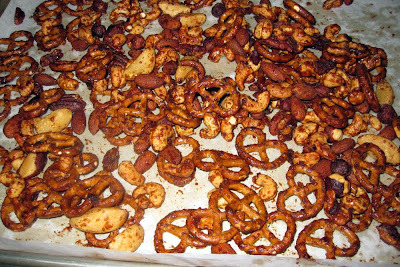 Remove from the oven and cool completely. Once cool, break up the clusters and serve. 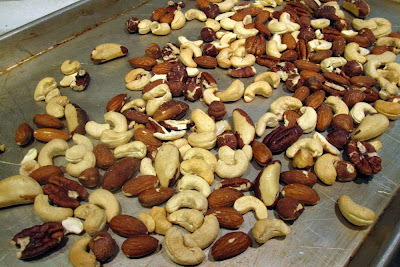 Storage: The nuts can be stored in an airtight container, at room temperature, for up to five days. 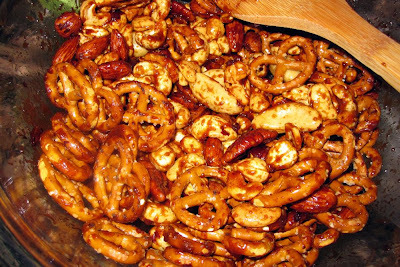 I have made this twice, once with chili powder and once with smoky paprika! I like it both ways, but do think I prefer the chili powder! I like it spicy! I just finished the second batch and your pictures make me hunger for more!!! 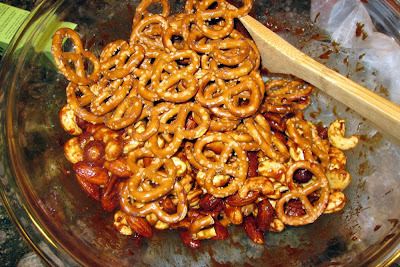 I think I might try this with Chex added, and only a bit of the chili powder, and see if my girls will eat it! Hi Marni! I've made this several times, but without the cocoa powder. 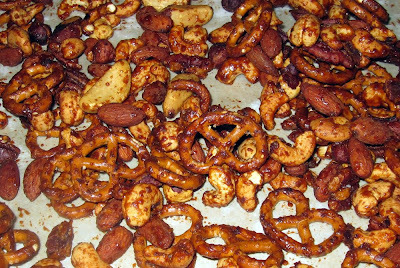 The sweet/ spicy combination is so yummy!